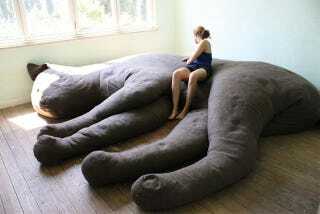 GIANT CAT SHAPED COUCH! GIANT CAT SHAPED COUCH! Throw away your crappy regular shaped couch, and get a CAT COUCH. Finally a cat creation that will cuddle you back for hours, before you finally crawl away in a puddle of your own tears. This is Felix Domesticus, created by Unfold, a design studio in Antwerp, Belgium. It's just one of their many cat installations. And it is glorious.